2383 Bensley Street. Welcome to this sought after Del Webb Jackson model situated on a premium lot within the 55+ age restricted community of Sun City Anthem. This perfect location on a peaceful street offers close proximity to the Liberty Center, Anthem Center, and the Revere Golf Course. The clubs of Sun City Anthem provide world class entertainment, dining, relaxation, wellness, fitness, aquatics, recreation, activities, clubs, and an exciting social calendar. You will fall in love with the gorgeous curb appeal composed of paver stone driveway, architectural elements, and a covered front entry. Step through the eight-foot entry door and embrace the feeling of style and luxury. This fine Jackson model offers an open and bright layout with comfortable living space treated to a ceiling fan, surround sound, and a French door with side screens leading to the outdoor living space. Positive flow makes you feel right at home. Sizable kitchen is absolutely stunning featuring contemporary cabinetry with pull out shelves, top-tier granite counter tops, breakfast bar, sleek Ge Profile appliances, and a pantry with organizational shelves. Restful master suite offers a large walk-in closet, over-sized shower, oval tub, and a glass block allowing natural light to pour in. Master suite is highlighted by a French door enhanced leading to the patio. Home features many fine finishes throughout such as two-tone paint, stone pattern tile, hardwood laminate, crown molding, six-inch baseboards, ceiling fans, quality fixtures, and nine-foot ceilings. Additional extras include intercom communication system, low-e windows, garage shelving, and hot water heater with recirculating pump. Convenient laundry room is spacious and flexible creating an ideal office, craft room, or workshop. 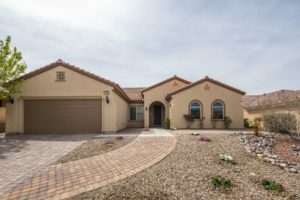 You will be impressed by the quality and beauty of this home as well as the fully landscaped outdoor living space complemented by a thirty-six-foot covered patio along with two ceiling fans.